Recreational and Diversional Therapy Department is funded by the Community Chest. The goal is to enhance psycho-social well-being to cancer patients and their family members. The services are provided mainly to our in-patients of The Hong Kong Anti-Cancer Society Jockey Club Cancer Rehabilitation Centre (JCCRC), but also welcome community cancer patients. Festival celebration parties and outdoor activities – aims to foster festive spirits and atmosphere for patients and their family members, who are able to share happiness among each other and relieve stress during the events. Peer Support Group – it facilitates volunteers to build up an interactive and mutual support network to share inspirations and experiences and more importantly, to unload unwanted emotional distresses so to move forward positively. 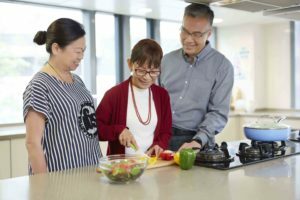 Therapeutic activities and interests programs – invite JCCRC in-patients as well as those living in the community to participate. 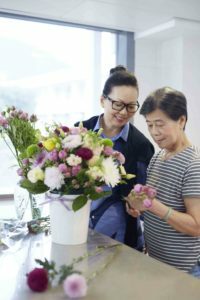 Workshops or classes on Art Therapy, Music Therapy, Horticultural Therapy, Mindfulness Therapy, cooking, Chinese calligraphy, handicraft, flowers arrangement and Yum Cha (Chinese Dim Sum) are particularly popular. Patients enjoy the distraction and temporarily take their minds off from their pain and worries. They not only find their interest in these classes and but often discover their hidden talents.